The eldest of the Big Three, the Hartmann and Fehrenbach Brewery, had its origins with the “Father of Lager Beer in Delaware”. Christian Krauch had under his employment a young barkeep by the name of John Fehrenbach. Born in Ettenheim, Baden, Fehrenbach came to Philadelphia in 1849 and learned the art of brewing while working in Lewis Raab’s small lager brewery. Fehrenbach moved to Wilmington in ’52 and worked in the King Street lager beer saloons of both Krauch and William Strimple. He moved back to Philadelphia and opened his own saloon in 1855. By 1860, Fehrenbach moved back to Wilmington and began running his own saloon and hotel. Three years later, he opened a lager beer brewery in the back of his hotel and saloon on the northwest corner of 4th and French Streets. Fehrenbach’s persuaded his brother-in-law, John Hartmann, to relocate from Philadelphia to Wilmington and enter the business with him. Hartmann had immigrated from Heidelsheim, Baden to Philadelphia in 1847. Like Fehrenbach, he was also involved in the saloon business in the Quaker City. Hartmann moved south to Wilmington in 1865 and began assisting Fehrenbach in his brewery. The end of the Civil War brought a period of renewed economic optimism and increased immigration to cities like Wilmington. 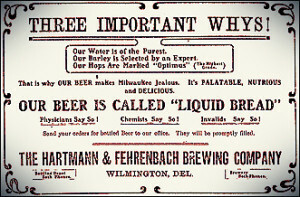 Hartmann and Fehrenbach recognized the opportunity to expand into commercial brewing, as the city at that time was being served by only one other large brewery. In late 1865, the partnership of Hartmann & Fehrenbach purchased land on the western edge of the city, near Riddle’s Road, Lovering Avenue and Wawaset Street, and had a brewery and hotel constructed the following year. The original H&F brewery had the capacity to produce about 30 barrels per day but their annual production tallied only about 1,000 barrels. Hartmann and Fehrenbach, both conservative managers, began their business on a small scale and reasoned that they would expand with proportionate rapidity to meet the growing market demands for lager beer. Their simple strategy worked. While the company catered to the home trade from the start, they also supplied lager beer, porter and brown ale to local hotels, saloons and restaurants. 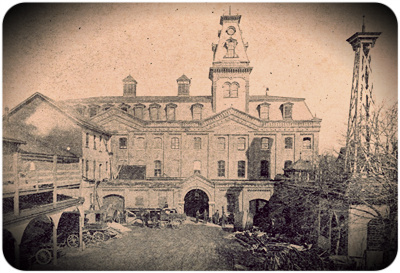 By 1872, H&F had increased its business such that they were forced to expand their brewing facilities to keep up with ever-growing product demand. The success of the brewery allowed John Fehrenbach the capital needed to expand his saloon at 4th and French Streets. Fehrenbach purchased land adjoining his existing saloon in 1877 and built a larger, more commodious business at the location. It is likely at this point that all of the brewing operations were transferred from the saloon to H&F’s commercial brewery. Increased competition and a growing market for beer provided H&F with all the impetus they needed to expand their brewery. 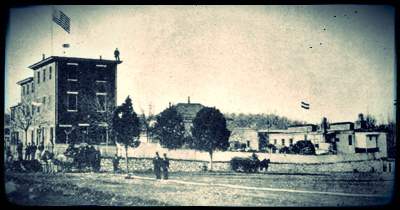 In 1878, as a few of the original H&F frame buildings removed. A three-story building was erected in their place at the cost of $30,000. Two large steam boilers, 80 and 50 horsepower, now supplied the H&F brewery with power. The new decade of the 1880’s saw a national trend away from small partnerships and towards incorporation. 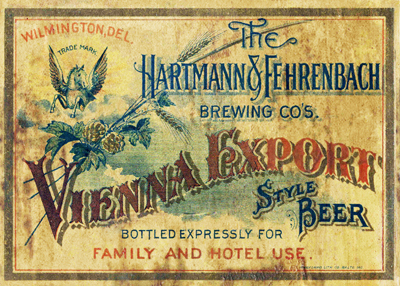 On August 1, 1885, the Hartmann and Fehrenbach Brewing Company, Inc. became an incorporated entity. Hartmann was named president with Fehrenbach serving the dual roles of vice-president and treasurer. Hartmann’s son, John G., was the company’s secretary. H&F’s annual production had grown that year to 35,000 barrels. The company suffered its first major set-back in October of 1887 when founder Fehrenbach died John G. Hartmann assumed the role of vice-president with J. George Fehrenbach, the founder’s son, taking over as treasurer. H&F undertook its most significant facility upgrades ever in 1888 when a massive four story brewhouse and cold storage facility was constructed, increasing the brewery’s production capabilities to 75,000 barrels. The re-vitalized brewery, named the Brandywine Lager Beer Brewery, allowed H&F to better supply their customers throughout the Delmarva Peninsula, southeastern Pennsylvania and northern Maryland. In 1890, founder John Hartmann, who had been ill for a number of years, died. John G. Hartmann was elevated to company President, a role he had practically assumed during his father’s illness. George Fehrenbach entered the business as Vice-President with John Rossell as the Secretary-Treasurer. Levi A. Bertolette, a city magistrate, was tapped by the firm to serve as General Manager. The year 1890 also saw the Hartmann & Fehrenbach Brewing Company expand their operations into bottling, when they built a bottling department and depot at 405 Orange Street. H&F’s glass bottles were beautifully embossed with the company’s logo, the mythical winged stallion, Pegasus. In 1896, the founders three sons finally assumed complete control of the brewery with John G. Hartmann as President and General Manager, Charles Fehrenbach as Vice-President and George Fehrenbach as Secretary-Treasurer. These three officers would hold the same positions for the next 24 years. The final years of the 19th century saw H&F make several additional improvements to the brewery complex, including a new brick bottling house along Wawaset Street in 1899. While H&F’s sales remained steady through the early part of the 1900’s, there were ominous threats to its business on the horizon. While Prohibition forces won major “Local Option” battles in southern Delaware and elsewhere, H&F continued to make capital improvements. The biggest involved a 1912 project to convert the brewery’s steam power source to electricity. With the end of beer production clearly at hand, H&F amended its corporate charter in 1919 to change its name to the ‘Hartmann & Fehrenbach Products Company’. 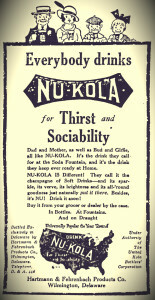 This signaled the intention by the partners to continue the manufacture of beverages beyond the implementation of National Prohibition, though, of course, the firm’s new products would be of the non-intoxicating variety. By July, H&F Products Company had already began production and sale of Good Cheer, a cereal malt and hop ‘near beer’ beverage, which contained less than half of one percent of alcohol, as required by federal law. 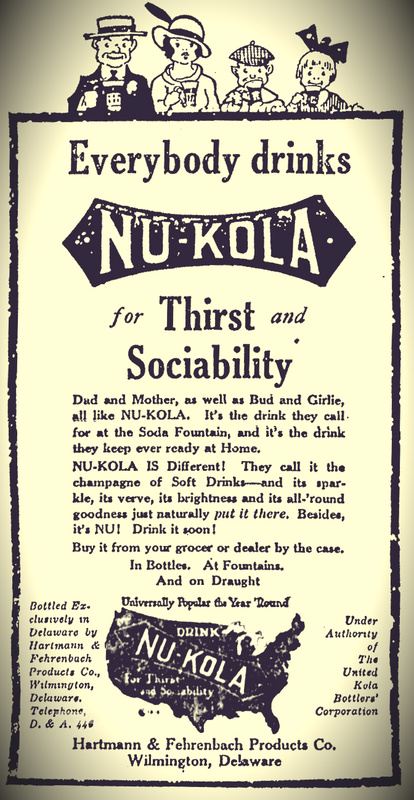 Late that same year, H&F began bottling and distributing soft drinks like Nu-Kola. Unfortunately, the H&F’s soft drink sales were not enough to sustain such a large physical plant. On August 25, 1920, with the new business model clearly not working, Hartmann & Fehrenbach shuttered operations for good. H&F Products would remain a business entity for another decade, albeit strictly on paper. Perhaps H&F held out hope that beer brewing would someday be made legal again. Unfortunately, the ensuing years would see the death of J. George Fehrenbach (1923), his brother Charles (1925) and John G. Hartmann (1927). Following John’s death, nephew John H. Hehl, former Vice President of Wilmington’s Bavarian Brewing Company and, later, Peninsula Products Company, was selected to succeed Hartmann as H&F’s president. With much of the brewery complex in a state of near dilapidation, the only job left for Hehl was to dismantle the company and sell off the complex for development. In August 1932, destruction began on the largest and most significant structure on the complex- the three-story main brewery building along Wawaset Street. Development of a series of six townhomes was soon completed on the footprint, all of which remain standing to the present day. A blue granite retaining wall, the foundation of the original H&F brewhouse of 1888, can be seen along Wawaset Street next to the townhouses. The the H&F bottling plant on Wawaset now serves as a law office. The H&F office building remained attached to the saloon until it was taken down in 1969 to make way for the new B. Frank Shinn Paint Company store. John Hartmann’s former hotel and saloon survives today as Galluccio’s Restaurant and Pub. These are the only facilities remaining that bore witness to Delaware’s Golden Age of Brewing.